A Sanctuary is a place where one can retreat, feel safe, and gather strength at trying times. Such a sanctuary can also be mis-appropriated by those who feel threatened, to the detriment of the “others”, whom they ostracize and exile. By damming the river of change and keeping out those who seek to differ, the sanctuary becomes stagnant, resulting in decay, and ultimately, destruction. Join Tactus On February 18 and 19, 2017 for a performance combining the twin stories of the fall of the ancient sanctuary of Jerusalem via settings from the book of Lamentations, and the crucifixion of Jesus, the Sanctuary of souls, via Lenten polyphony. In conjunction with Renaissance polyphony presented by the full choir and subsets, and unified via organ interludes by Bill Visscher, we will present readings from our first poetry competition. Join us for a unique concert experience that juxtaposes contemporary and classical themes, the Old Testament and the New Testament, and ancient riffs with newly composed music, together ushering Renaissance polyphony into the 21st century. Tactus is proud to announce the winners of our first Poetry Contest! Please join us in congratulating the successful poets. These entries will be read during our upcoming concert set Sanctuary & Exile on February 18 & 19, and the live stream & recordings available to our supporters on Patreon. If your poem did not win a prize, do not despair, but send in an entry for our next concert to be held in May/June! Original details of our poetry contest follow. Tactus announces a poetry competition for our upcoming concerts on the theme of "Sanctuary and Exile" on February 18 and 19 in the San Francisco Bay Area! Courtesy of the California Arts Council and the San Francisco Early Music Society, the top two entries will receive a first prize of $100 and second prize of $50. Tactus constantly strive to bring Early music to new audiences in the Bay Area, searching for novel ways to reach a diverse public, and we hope that this competition will enable those affected by recent events a creative outlet for their energy, while building bridges, rather than walls. All poems must be original works by the entrant. Submissions may have been previously performed in public, but must not have been published elsewhere. A certificate to this effect is required along with the submission (see Submission Checklist and Certification below). 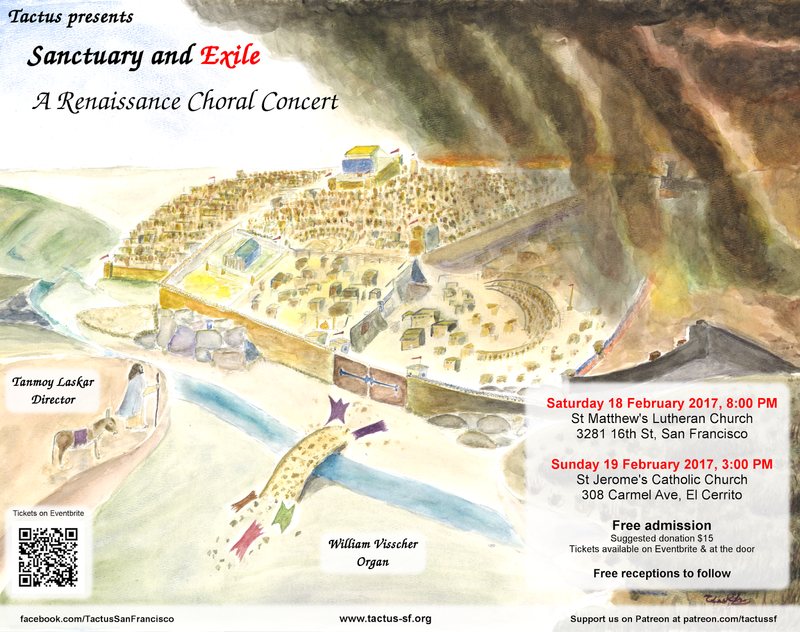 Poems can be rhyming or free-form, but must conform to our concert theme of "Sanctuary and Exile". Details of the concert theme and the music are available on our website here. Poems in any language are welcome. If writing in a language other than English, please provide a translation. A maximum of one entry per poet. Three prize-winning entries will be selected by a committee comprising members of the choir for live performance on February 18 and 19 as part of the Tactus concert "Sanctuary and Exile". The top two entries will receive prizes of $100 and $50, respectively, courtesy of the California Arts Council and the San Francisco Early Music Society. Tactus reserves the right to award fewer prizes than advertised, depending on the quality of submissions received. The authors of the winning entries will be invited to the concerts to perform the poems themselves. No reimbursement will be provided for travel associated with attending our concerts, but publicity for the authors will be offered via our website, tactus-sf.org. Certified statement that the submission is your original poem (text provided below). Optional: a reading of your poem (in mp3 or other compressed audio format). This is encouraged if your poem is in a language other than English. The reading will not be used in the performance directly. Please include the following statement in the PDF at the end of your submission. I agree to the terms of the Tactus poetry contest for "Sanctuary and Exile". I hereby certify that my submitted entry is entirely my own work, and has not been previously published elsewhere. If my entry is selected, this poem may be read at the Tactus concerts on February 18 and 19. For any queries, please contact the director, Tanmoy Laskar, at tactussf@gmail.com.